American women absolutely dominated in Rio. From Virginia Thrasher all the way to Claressa Shields, U.S. women captured medal after medal to help the United States finish with 121 Olympic medals overall, almost double the number of medals captured by second-place finisher China. But for all their hard work and incredible feats of strength, speed, and endurance, coverage of the 2016 Summer Olympics often failed to treat female and male athletes the same. So while U.S. women led the nation's Olympic medal count, sexist commentary throughout the Games often diminished their impressive accomplishments. Of those 121 U.S. medals, American women won 61 of them, American men won 55, and there were five medals earned in mixed events. But despite the obvious sheer athletic skill at the 2016 Olympic Games, coverage was, unfortunately, ripe with sexism. When Corey Cogdell-Unrein won a bronze medal in trapshooting, the Chicago Tribune chose to identify her as merely the "wife of Bears' lineman." When the U.S. women's gymnastics team was caught laughing together in celebration after completely obliterating the qualifying round, an NBC commentator remarked they "might as well be standing in the middle of a mall." When swimmer Katie Ledecky set a new world record (and earned gold) in the women's 800m freestyle a newspaper squeezed in her accomplishment below a large headline touting Michael Phelp's silver medal tie win. When Simone Biles won gold in the individual all-around she had to shut down reporters who insisted on likening her to male athletes "I'm not the next Usain Bolt or Michael Phelps. I'm the first Simone Biles," she said. Of course, the sexist commentary wasn't strictly limited to American women. Female athletes from around the world found themselves targets. Hungarian swimmer Katinka Hosszu's world record breaking gold medal victory in the 400-meter individual medley was credited to her husband by NBC commentator Dan Hicks. While also her coach, Hosszu's husband wasn't the one swimming in the pool. Dutch gymnast Sanne Wevers was caught on camera writing down her score after finishing her beam routine, causing commentator Al Trautwig to hypothesize she was writing in her diary. The United States had an impressive show at the 2016 Olympic Games, and women especially so. 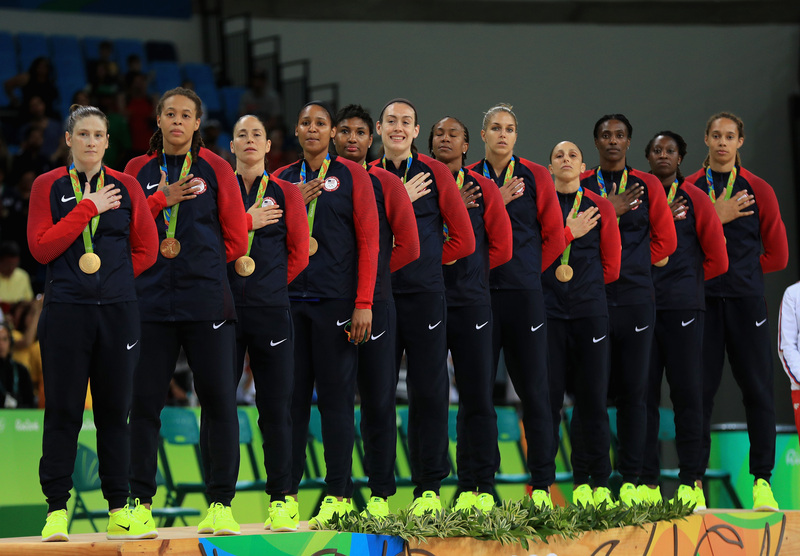 Team USA's medal count is no small feat. Without a doubt, every athlete in the U.S. delegation, male and female, deserves to be applauded for their accomplishments. But until women's sports receive the same coverage men's do and female athletes aren't asked to "give us a twirl," it's important to remain critical of such sexist commentary.